1. Where can I find your shuttles? What is REDY2GO’s service area? At this time, REDY2GO offers airport shuttle service in the Sydney metropolitan area. Our expansion plan includes the addition of several new locations throughout Australia in the near future. Join our mailing list to be notified when REDY2GO will be in your area. 2. What are REDY2GO's hours of operation? REDY2GO's call centre is open 24 hours, 7 days a week on 1300-2-GO-NOW (1300-2-46-669). You are able to reserve your seat on one of REDY2GO's Airport Shuttles by using our online booking facility at www.REDY2GO.com.au/reservations. REDY2GO's Airport shuttles operate from 0500 to midnight daily. If your reservation is outside these hours, we can provide a private car from as little as $55. 3. How often does REDY2GO depart Sydney Airport? REDY2GO leaves Sydney's International Terminal, T1 for all downtown hotels every 30 minutes. Please look out for REDY2GO's Black & Green vans. REDY2GO will meet you at the yellow zone in map above. REDY2GO Airport Shuttles leave Sydney’s Domestic Terminal, T2 for all downtown hotels every 30 minutes. Please look out for REDY2GO's Black & Green vans. REDY2GO will meet you at the orange zone in map above. 4. At what time does REDY2GO’s last airport shuttle depart Sydney Airport? 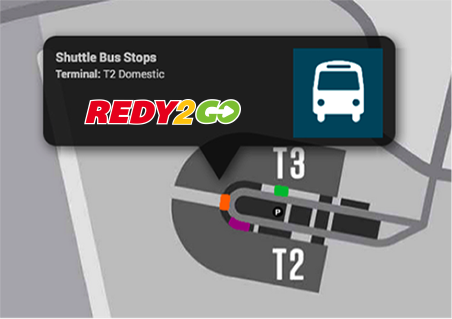 REDY2GO's last shuttle bus departs Sydney’s Domestic Airports at 23:30 (11:30pm) and Sydney’s International Terminal at 23:45 (11:45pm). If you have a reservation and foresee you cannot meet these timings, please feel free to contact our 24hour call centre on 1300-2-GO-NOW (1300-2-46-669) and advise so as a resource can be available for when you emerge from the terminal. 5. How much does REDY2GO cost? 6. What payment facilities does REDY2GO offer? 7. What is the age limit to qualify for a child rate? Child rates apply up to the age of 13. 13 years and over are charged at adult prices. 8. Do you offer infant seats or baby capsules? Not in our shuttle bus service, however infant seats and baby capsules are available in a private car/shuttle transfer at $22.00 per each seat required. 9. How many passengers can I fit into REDY2GO’s shuttle? Eleven (11) passengers fit in a standard shuttle, however larger vehicles are available on request. 10. What is REDY2GO’s Cancellation Policy? REDY2GO's service is non-refundable. REDY2GO allows passengers to reschedule their reservation and use those funds on their next travel within six months of that date, provided they inform our office they won't be travelling on their originally booked date. Users will then be able to use their reservation number within six months. 11. Why does REDY2GO want my flight details? REDY2GO uses your flight information to track your flight and strategically place resources at hand for when you’re REDY2GO. Once your flight has landed and you’ve collected all your bags, you should call our REDY2GO hotline 1300-2-GO-NOW (1300-2-46-669) and advise dispatch that you are in fact REDY2GO . Your Shuttle is then dispatched to collect you and take you to your destination. 12. Does REDY2GO offer secure ordering? REDY2GO uses encryption, firewalls and other technology and security procedures designed to protect the accuracy and security of your personal information and prevent unauthorized access or improper use. A secure server running the latest 128-bit encryption handles all our payments, there is no safer way to order online. Look for the lock key at all times. 13. How many bags can I take with me? REDY2GO permits one (1) bag plus one (1) carry-on. If you have additional bags, please inform our office. 14. How are my luggage items transported and what is the policy regarding lost items? 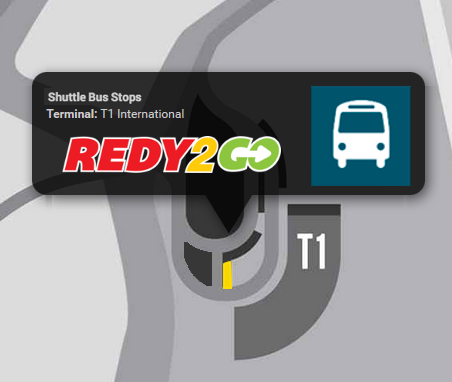 REDY2GO uses 11 seater vehicles most of the time as an offering to all passengers. These vehicles have been designed to accommodate passengers and their luggage without any further luggage facility attached to the vehicle. With larger groups, a trailer is used where we cannot accommodate this inside the vehicle. It is company policy that all luggage items MUST accompany you in your REDY2GO Shuttle. REDY2GO assumes NO RESPONSIBILITY for your luggage. It is the clients responsibility to ensure ALL items are collected when entering or exiting the vehicle. If you report that an item was left in a REDY2GO Shuttle and that item is found, we will make every effort of returning this to you. The return of the item will be at your cost. For all other items found in a REDY2GO Shuttle, they will be registered into our lost and found and held for a period of no more than six months. Any unclaimed items will be sold and proceeds will be donated to a charity of our choice. 15. When I’m waiting to be collected from a hotel, residence or business, how do I recognize REDY2GO’s service? 16. What is REDY2GO’s pickup-time policy? REDY2GO will make every effort to collect you at the requested booking time. We ask that all passengers be REDY2GO 15 minutes prior to the actual booking time. REDY2GO strives be at your pickup location between 10 minutes prior and ten minutes after your requested pickup time. Should you have any questions, please don’t hesitate calling our operations office on 1300-2-GO-NOW (1300-2-46-669) for more information or clarification. 17. Do I need to make a reservation? Yes, REDY2GO requests that all bookings be pre-booked so as to ensure a service is made available to collect you. 18. If I have two or more people in my group and we are headed to the same destination do I need more than one booking? When booking the service, you only need to make one reservation for the whole group. You must indicate how many passengers are travelling. REDY2GO will issue one confirmation to whomever is in charge of the group. 19. Can I purchase a ticket at the Airport? 20. I live in the suburbs and want to use your service, can I book REDY2GO to collect me from my Home? 21. What if I need a special service or accessible vehicle? We ask that you kindly contact one of REDY2GO's booking agents on 1300-2-GO-NOW (1300-2-46-669) to make this request and will ensure the appropriate vehicle will be there to accommodate your needs. 22. What number can I call if I have any further questions? Who do I contact for service? All REDY2GO services are covered by REDY2GO's standard terms and conditions. Qantas Frequent Flyer points are earned for standard rates on service, including GST. Incidental costs or extra charges such as food and beverage, tolls, entrance fees, mobile phone usage, airport charges, accommodation, venue costs or other incidentals do not earn points.